He'll love to have the company of his children or grandchildren when he sips his coffee from this custom coffee mug! A great gift for any grandpa or Dad this Father's Day! Personalize with any title surrounded by word art names. If you would like to see another rendition of your word art design simply select the View Your Personalization button again. This will automatically create another version for review. Check out all of our personalized Father's Day gifts for Dad and birthday gifts for him! 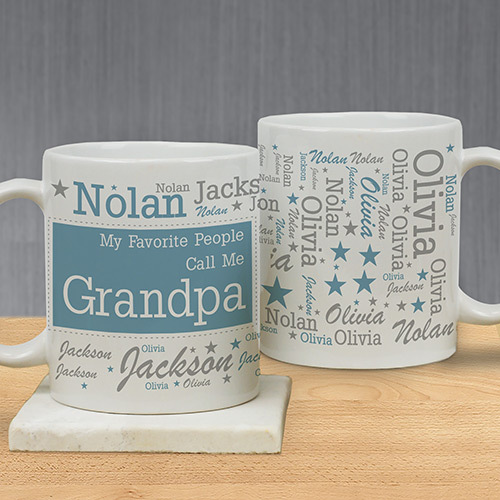 The grandparents loved their mugs! It was a Father's Day gift. Grandpa loved that it had all the grandkids' names on it.